Lasercoil Technologies LLC, Napoleon, OH, has developed LaserCoil CAM to support its coil-fed laser-blanking systems, automating the importing of part profiles for optimized nesting and cutting. LaserCoil CAM accommodates single and multiple cutting heads, as well as peripheral automation such as the system’s dynamic conveyor lanes. 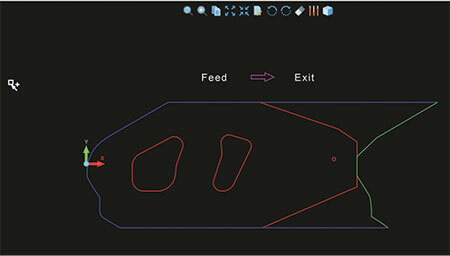 In addition to optimizing part recipes, LaserCoil CAM also controls and monitors the blanking system during production. LaserCoil CAM begins by creating a recipe with prebuilt initial cutting parameters supplemented with the blank’s profile data imported via a CAD file. The user can either ask the software to select the best coil from multiple coils in inventory, create the best nest for a specific coil width, or permit the program to specify the optimum coil width based on part yield. Taking into consideration the appropriate grain constraint for material flow as well as part profile, the software identifies the best nesting pattern and then determines how the profiles will be cut by the laser. Next, the operator generates the cutting path; he can make adjustments by clicking on the profile parameters and setting a new cutting routine. The software then generates a simulation to illustrate the sequenced travel path of the cutting head. “This software provides our customers with a single interface to help reduce programming time and scrap rates, as well as improve their throughput and yield,” notes Scott Sonnenberg, LaserCoil director of mechanical engineering/product development.